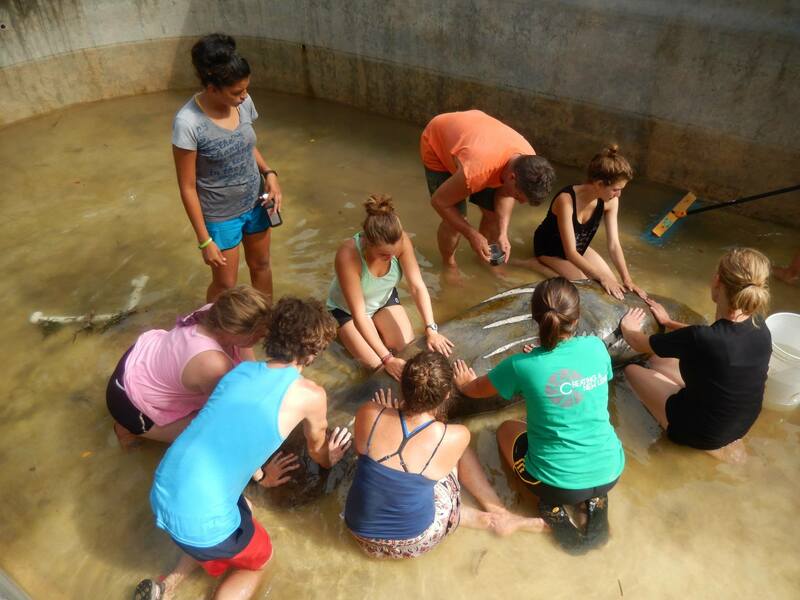 Today we have released Ben the manatee into the wild. It was a long grueling morning beginning with getting him onto the load platform in his concrete pool. We all helped coax him with food onto this platform and then began to drain his pool. This allowed us to get him onto a sling and attached to a pulley that would lift him out of the pool and onto a pad below his pool on the ground. During this process, the concrete and steel bar pulley up-heaved from the ground due to his weight. He weighed just below 600 pounds. This process was very scary because he nearly fell out of the sling when the pulley failed. However, we were all alert, aware, and well directed on how to execute this maneuver, keeping Ben perfectly safe. Our next task was to hand carry him to the boat loading platform. We attached the tracker on the peduncle of his fluked tail. Finally we measured and weighed him for release data and again attached him to a second pulley and maneuvered him into the boat. Ben was finally ready for his trip out to sea. Another boat of manpower followed Ben’s boat and they traveled 15 miles across the lagoon to where ocean and freshwater met. The last step of his release involved sinking the boat and watching him swim on his way, free as he once was. This experience was most incredible to participate in and see up-close and personal. It is a moment in my career and personal life that I could never forget, and I am eternally grateful!! Wildtracks has been my family for the past 2 months now and what an adventure it has been ! My heart is filled with joy when I look back on all my experiences here. Everyone plays a significant role, down to the blasted mosquitoes. I find so much peace in the work I have done here. It’s no wonder so many return! I will miss my howler monkeys the most: Cat, Balou, Cho, and Joe. The relationships I developed with these monkeys will last me a lifetime. I have learned each one’s personality, their likes and dislikes, and enrichment interests. I developed an emotional attachment that my supervisor said would prepare them best for release into the wild. It is true what they say, when you love what you do, work isn’t work here! The difference you make here volunteering is very real, whether it be with the animals or the amazing people I worked with all around the world. The people I met here contributed to my experience just as much as the animals. After building some of the best friendships I have ever found, I’ve come to a theory. We are all a bunch of misfits who find love and purpose working with those who can’t speak for themselves. If more people experienced what I have here at Wildtracks, the world might be a different place. I am truly grateful for Paul and Zoe’s vision and that I was able to be a part of it! !